Drawing 3 shows alternative designs for the wall on St Bartholomew's Lane. Drawing 4 shows a more refined, variant design. 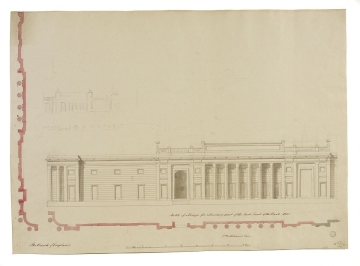 In both drawings, the wall on Threadneedle Street has a blind portico of four recessed columns. Drawing 4 shows six columns in antis flanked by large doorways (one blind) and surmounted by a single panel that is between balustrades. 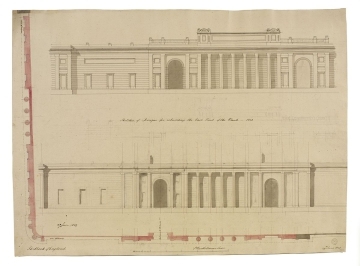 The rough pencil elevation shows a design more similar to the executed wall, with eight columns in antis surmounted by a taller attic. Drawing 3 shows four columns in antis between semicircular-headed arches. The attic has an acroterion and fluted pilaster motif that is common to the Lothbury Street screen wall.